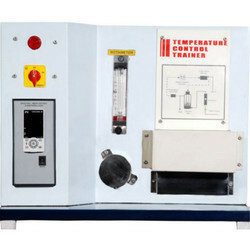 Manufacturer of a wide range of products which include level control trainer, pressure control trainer, single tank system, temperature control trainer, two tank interaction system and interaction & non- interaction system. Water Tank Material Stainless Steel, Capacity 10 Ltrs. We are an eminent firm offering Level Control Trainer. The process setup consists of supply water tank fitted with pump for water circulation. The level transmitter used for level sensing is fitted on transparent process tank. For ease of understanding, the product is described with its major components. To meet the requirements of our clients, we are offering quality based product to our valuable suppliers. 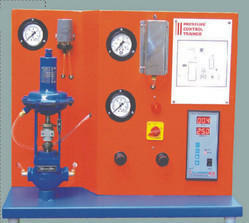 The setup consists of a process tank in which compressed air enters through a Pneumatic Control Valve. The pressure transmitter is fitted on the process tank. The air pressure in process tank is sensed by the transmitter and communicated to the digital indicating controller. This measured variable is compared with the set point by controller and output is generated and given to i/p converter, which in turn supply the 3- 15 psig pressure to vary the opening of the pneumatic control valve to eliminate the error observed. As the opening of pneumatic control valve varies, the pressure in the process tank gets effected. This process goes on until the set point target is achieved. A ball valve is also provided in the process tank to disturb the system and to observe the effect of disturbance. These units along with necessary piping are supported in a well- designed housing and are fixed on base plate.The present set-up is completely computerized controlled. The digital indicating controller has a facility to interface the system with computer which enables to change the PID parameters using computer. The educational software and data-logging package has been developed for unit. The software environment base is of lab view of national instruments, USA. This software is compatible to interfacing unit designed by k.C. Engineers. This software package provides a comprehensive educational software environment within which the PID investigations can be performed. 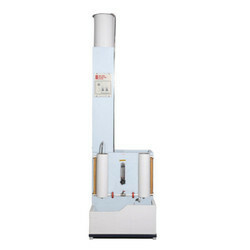 This software is capable to tabulate the sample readings according to the requirement of experiment under study and results obtained can be compared. The real time data acquisition can be done by interfacing the set-up with computer using software. The setup studies behaviour of Single Tank System. It consists of supply tank, pump for water circulation, Rotameter for flow measurement, one process tanks with scale. The components are assembled on frame to form tabletop models. 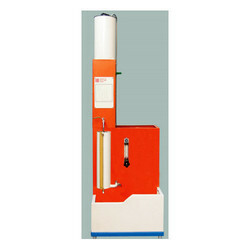 The process setup consists of heating tank fitted with Temperature Control Trainer for on line heating of the water. 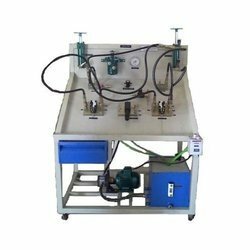 Water is supplied from laboratory constant head tank and its flow can be manipulated and measured by provided rotameter. The temperature of the heated water is sensed by RTD sensor. This measured variable through temperature transmitter is communicated to digital indicating controller. Error is calculated and output, accordingly, is communicated to thyristor controlled heater to achieve the set point. These units along with necessary piping are supported in a well-designed housing and are fixed on base plate.The present set-up is completely computerized controlled. The digital indicating controller have a facility to interface the system with computer which enables to change the pid parameters using computer. The educational software and data-logging package has been developed for unit. The software environment base is of labview of national instruments, USA. This software is compatible to interfacing unit . This software package provides a comprehensive educational software environment within which the PID investigations can be performed. 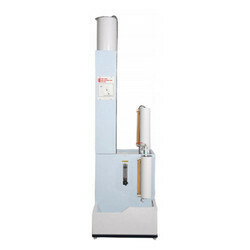 This software is capable to tabulate the sample readings according to the requirement of experiment under study and results obtained can be compared. The real time data acquisition can be done by interfacing the set-up with computer using software. This software can be used outside the laboratory with the computer to familiarize the students with the equipment and procedures with the help of flow diagrams provided in the software. In flow diagrams set point, process variable and controllers output are visible on the screen and this data can be transferred in excel files for further calculations, plotting graphs etc. Software allows the user to have control on sampling time, data logging, printing the stored data, preparing spread sheets in excel etc. The setup studies behavior of multi capacity process when connected in interaction mode. It consists of supply tank, pump for water circulation, rotameter for flow measurement, two independent process tanks with scales connected in interacting mode. The components are assembled on frame to form tabletop set-up. The whole unit is assembled rigidly on a base plate. Most of the parts are powder coated and rests are painted with auto paints. Looking for “Process Control & Instrumentation Lab”?